"It's all about the ride!" 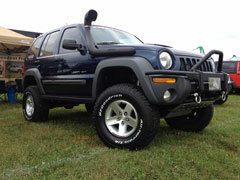 Make your Jeep Liberty ride like a Mercedes-Benz! Your spouse will thank you! I wanted to take a few minutes to tell you how happy I am with the 02 KJ lift that I purchased. Now for the readers, you ALL need to know that when you’re looking for a lift kit for your 02 or later Jeep Liberty, Jeepin By Al is the place to go. Yes, you will pay “up front” for the kit, but it is well worth it! Let me share a very short story. I purchased my first lift kit at a competitor out of Utah, The parts included a springs, strut, spacers. Later on, I added control arms. I was assured that kit was the one for my vehicle. As you all know there weren’t many lift options for the KJ back in 02-03 and there never are many options right away. I installed this kit, having to muscle the parts into place. I was left with many bangs and ka-bongs on the roadway and the trail. Another huge problem was the alignment. I was told by the lift vendor that thealignment could be set to near factory settings. I cannot tell you the actual cost associated with 2 sets of tires I went through, not to mention the numerous alignment shops I visited, including the Jeep dealership. The tech at the Jeep dealership summed it up best when he said, “That’s as close as I can get it with that lift you got”. I was not satisfied and somewhat demoralized, but I coped with it believing this was the ride I paid for. I upgraded the lift with same company many times after having added a bull bar/winch to my KJ. Still the ride suffered, the bangs and ka-bongs remained. I was on vacation and actually drove to the company and shared my displeasure. I need not say more about the other company. About two years ago, I visited the JBA web page and began to read all of the literature available. Like you, I noticed the cost and thought there is no way I would afford the amount of money! However after a while, I broke down because I had replaced the aftermarket control arm bushing for the 3rd and final time. I’ve probably ripped the entire front end apart on my KJ about 10 times. I called JBA and spoke with Marlin about my frustrations and he was quick to explain/repeat everything I had read on the web page. He did so in a proper manner and assured me that any potential purchase was the right way to go. I had some follow-up conversations with Brent and he too was great to work with. Ultimately I purchased the JBA Basic lift, along with the latest UCA’s and the sway bar disconnects. It has been 4 full months since I installed the products. What did this equal? Well first, everything installed as advertised. Second, the alignment was dead on to factory specs! Third, the ride is outstanding!! There are no bangs or ka-bongs anymore. Taking even a speed bump is FUN without any headache’s. The rough trail rides are no longer full of noises with headache’s at the end.